The ultimate run time upgrade for your HPI Savage Flux HP or 2350! This is for 1 pair of our new Hard Case 9000XL 7.4V lipo packs. One left side and one right side custom wired to fit the Savage Flux battery compartment. These packs will work perfectly with no modifications required. There is no better pack than this if you're wanting to replace your 7-cell flat NIMH pack or upgrade your lower capacity lipo pack. This pack takes up the WHOLE tray, not just part of it. Long run times while holding incredible voltage under load. These packs will make your HPI Savage Flux scream! These batteries and this company are simply the best, will never buy any other battery, I have thousands of dollars in rc’s between me an my son, therefore only use the best batteries. I purchased 2 for my Traxxas Summit. 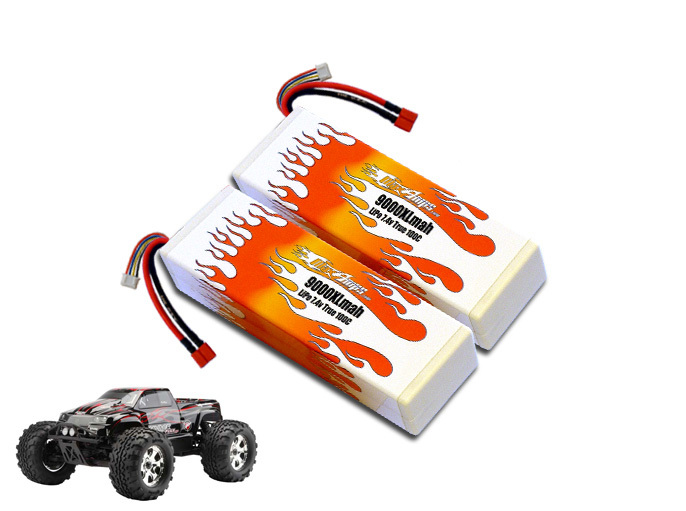 Awesome power, and they last way longer than any lipos previously purchased. Great batteries for a lifetime! These batteries are AWESOME!!! Great torque and punch, awesome run times with lots of power! Not to mention GREAT customer service! Matt is The Dude! Thanks guys for making my hobby so much more fun! Max Amps batteries, the best in the business!!! this battery is superb.love the power output through my savage.anyhow better change the clutch first because this battery got yummy juice!thumbs up! Just the best on the market.